Located on the eastern side of Maui an untouched Hawaiian island oasis awaits. 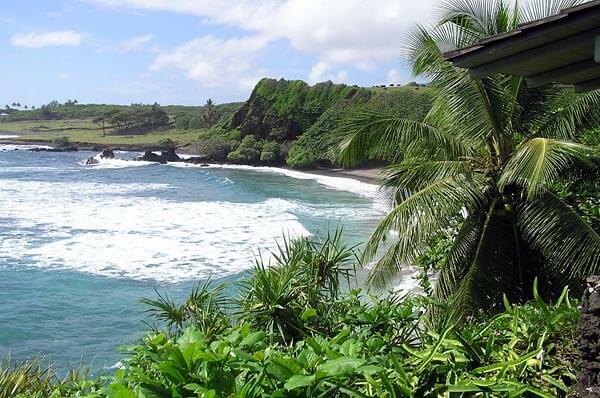 This part of the island located near Hana is not as developed as the rest, so you’ll be sure to have a vacation with the feeling of your own personal island getaway. Enjoy the beautiful breath taking scenery and lush landscape as you take in the views of the rocks with cascading waves. The coastline is spectacular and is made up of gray lava and coral crushed sand. Take time to venture up the seaside cliffs or enjoy the lush greenery and vegetation. Swimming and vacationing here during the summer and early fall will net the best experience. If you stay at the Hotel Hana-Maui you will have the luxury of midday bus shuttles that will take you to your beach destination. While you’re there, take a stroll along the soft gray sandy beach. You’ll find the Hotel Hana-Maui has some facilities (such as showers) that it shares with the public beach. This beach is a favorite amongst sunbathers as this is a relaxing beach with plenty of room to recline and soak up the rays. For those a little more sun shy, there is plenty of shade to protect them from the rays. The waves here also attract seasoned surfers and snorkelers. Body boarding is also an activity enjoyed on this beach. Less experienced swimmers may be a little intimidated by the rip currents. Use caution as this beach doesn’t have a lifeguard on duty but it still provides entertainment for careful vacationers. Open daily during daylight hours, no lifeguard in attendance. Last updated by Nikki Black on 08 August, 2011 in Destinations.